Bicycles were a nice way to run to the store or to take a quick campus tour. Marisa had the opportunity to ride in the "samlo" (rickshaw) that Buck refurnished. Everywhere we went peoples' heads were turning and they couldn't resist the neon lights and sweet sound system. 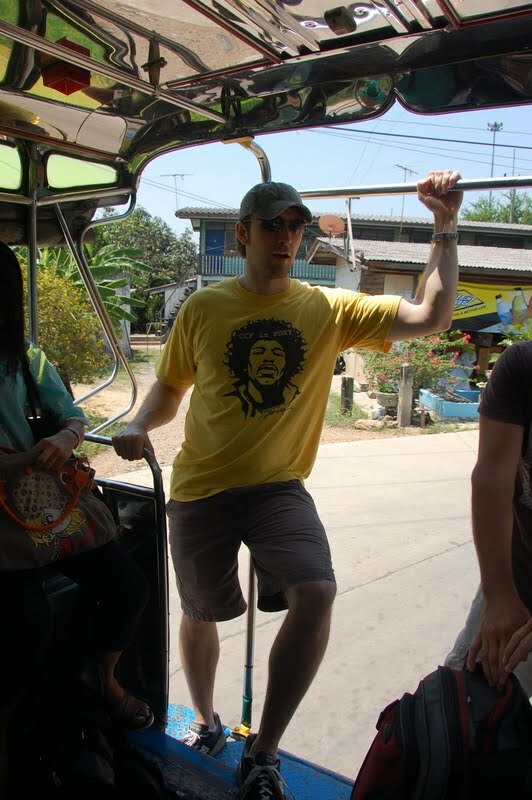 We took this train to Ayutthaya. It's a far cry from the electric German trains that we're used to, but it was cool riding with the locals in the coal-powered locomotive. This small truck with bench seats was a convenient way to get around in the open air on our scenic evening temple tour of Ayutthaya. 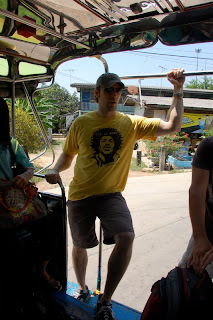 These "songthaews" are pick-up trucks with bench seats in the back were sort of like buses in that they had scheduled routes, but they felt more like carpooling. In contrast to the normal day trains, we took a couple of overnight trains to and from Chiang Mai. It featured bench seats that folded down into bunk beds for the evening and were easily converted back in the morning. Mae and I are enjoying a snack on the way up to Chiang Mai. We were lucky to grab this covered truck/taxi. During the rainy season you can get caught in an afternoon shower that will leave you drenched in no time. By far the most popular form of personal transit is the moped/motorcycle. We saw families of four cruising on these and individuals hauling all kinds of goods around town. The water shuttle in Bangkok was a quick way to get around the grayish looking waterways through the city. They pull up the blue tarps on the sides between stops so that you don't get splattered by nasty water. Practically all of southern Thailand is a skinny peninsula or isthmus (not sure what the correct geographical term is) with lots of islands just off of the coast. While there are bridges with ferries to take you across with land vehicles, we went with the larger boat to take us over to Ko Lanta. However you decide to go, the scenery is magnificent. Easily the most popular form of transportation, the colorful taxis were always in view with bright pinks, blues, yellows, greens, purples and probably others - all representing different taxi companies. I've never been in a place where a cab was more reasonably priced - for example, an hour ride to the airport for about $15! I couldn't take a cab to the grocery store for that rate in Germany. While we didn't get pictures of every mode of transportation taken.........I hope this gives you an idea of the plethora of ways to get you where you want to be.